Here is Tammy’s Friday appearance on Fox News. She along with Judith Miller focuse on the attempts by mainstream media to ignore the Select Committee’s creation. It’s great Tammy is being seen on Fox again. I think she handles these segments perfectly. Just so you know, her appearances on Saturday at 620pm et is now confirmed as a *regular* event! 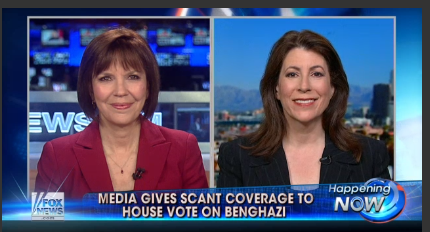 Good to see Judith Miller contributing to FNC. She was the NYT reporter who refused to reveal her source to Patrick Fitzgerald investigating the Valerie Plame ‘leak’ and Fitzgerald jailed her for 3 months. She won the Pulitzer Prize in 2001 or 2002 with James Risen of the NYT for their reporting on terrorism and 911. Risen is now fighting a prosecutor seeking his source for something. Risen calls the Obama administration the greatest threat to press freedom in some time. http://www.huffingtonpost.com/2014/03/25/james-risen-obama-administration-enemy_n_5027083.html I wonder what the two of them think about what has happened to the press in the last 15 or 20 years. Congratulations, Tammy! The wave is building! Great news – and happy the videos have been posted, thanks Gina.